Born in Korea in 1985, Ji-Yoon Park won first prize at the Hankuk Ilbo Competition at the age of nine, and two years later took home first prize from the Chosun Ilbo Competition. In 2001, one year after moving to France, she was awarded first prize at the Concours des jeunes interprètes de Canet in Roussillon, and went on to win first prize at the Tibor Varga International Violin Competition in Switzerland at age 18. She is also an award winner at the the Long-Thibaud International Competition in France in 2005, as well as the Queen Elizabeth Competition in Beligum in 2009. She has given recitals in Korea, France, the Czech Republic, Hungary, Germany and Switzerland and has played with such orchestras as the Seoul Philharmonic Orchestra, the Orchestre Perpignan Languedoc-Roussillon, the New Symphony Orchestra of Prague, Mexico National Orchestra, the Janacek Philharmonic Orchestra and the Orchestre national de France. Park made her North America debut as soloist performing the Michael Haydn Concerto with the Czech Philharmonic Chamber Orchestra touring throughout 7 cities in Canada. 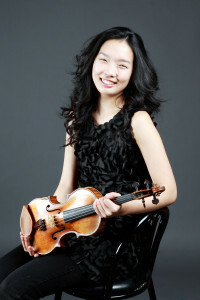 She also toured Italy with the Korean Chamber Orchestra in 2009. Her recitals have been broadcast on French radio, and festival appearances include Vezere Chamber Music Festival, Touquet Festival, Seoul Spring Festival, and Festival Prades. Park studied at the Conservatorie National de Paris with Roland Daugareil since 2000, and also at the Mozarteum in Salzburg with Igor Ozim, and studied chamber music with Jean-Jacques Kantorow and Itamar Golan. Park has been sponsored by Fondation Banque Populaire in France since 2009, and plays a violin by Pietro Guarnerius from 1717 with the support of the Kumho Asiana Cultural Foundation. She currently is Concertmaster at the Orchestre National des Pays de la Loire in France as well as a member of Kumho Asiana Soloists.